12 p. : ; 24 cm. "Approved Code No. 84--Supplement No. 34." Birtii-Jiiam, Ala.: 257 F,-deral Buildin.;g. Buffalo, N.Y.: Chamber of Commerce Buildinzg. Charleston, S.C.: ('lCambtir of Commerce Building. Cleveland, Ohio: C! ;miuler of Commerce. Dallas, Tex. : (Ciamriiih' of Commerce Building. Houston, Tex. : <'l4miilib'r of Commerce Building. Indianapolis, Ind. : Cli iamlrln of Commerce Building. T;ack-olnvill,. Fla.: Chamber of Commerce Building. Kansas City, A!.. : 1028 Baltimore Avenue. Louidi villa Ky.: 408 F.'oi,-:al Building. Memiphi-s, Tenn.: 22' l-V'dertl Building. Mi)iei!pli.~. Minn.: 213 Federal Buildiig. Norfolk, Va.: 406 East Plume Stri-ct.
P'lhi!.llllhiia. Pa.: 422 Commercial 'Tirust Building. Pittsburgh, Pa.: Ch:ii; nhr of Commerce Building. Portland, Oreg. : 215 New PI'.t i ::" e I. iii lilii4. St. Louis, MoI. : 5iiC Olive Street. San Fr:inci-,.o, Calif.: 310 Customhouse. Seattle, Wash.: 809 Fd-::';ll Office Building. Article V, Section 1 is deleted. Administrator for Indi,.fr';< Recovi ry. by you on the second day of November, 1933. Article I s-tates the purpose of the Supplpem'entary Code. competition in this division of the Industry. ments to the Supplementary Code. Article X provides against monoflpolies and monopolistic practices. additional increases in the seller's costs. Article XII states the effective date of this Supplementary Code. ployees; and is not classified by me as a major industry. restrictions on admission to membership therein. permit monopolies or monopolistic practices. MAY 24, 1934. A(BItni i.-ftrator. upon every inmler er thereof. facture for sale of Wire Rope and Strand. an employer or on his or its own behalf. trator fLir Indlistrial Recovery under said Act. as approved by the President on the 2nd day of November, 1933. Rope and Strand Ma;iiifactiirers As.-ociation, or its successor. Fabricated Metal Products F ,deration or its siicces-or. provisions of this Supplementary Code. Supplementary Code Authority is elected. as may be reasonably nece-sary to effectuate the purposes of the Act. as may be d(h-nlu.! equitable by the Supplementary Code Authority. under terms of said Basic Code. other than the Administrator or his duly authorized representative. all tiriin be subject to and comply with the provisions hereof. such other codes, if any, as may be related to the Industry. the Supplementary Code Authority and its activities. have assented to, and are complying with, this Supplementary Code. or members of the Industry. deavor to adjust or modify the transaction. I See piruigl.iiph 2 of order approvii Li this Code. cooperating in this Supplementt'ry Code. under written contract to act as such di. tributor. for payment, shall be thirty (30) days from the date of shipment. paid by the 25th of that month. if paid by the 10th of the following month. established by the law in the several states. of any interested party, shall cause the determination to be reviewed. be guilty of a violation of this Supplementary Code. ing to a violation of any provision of the Supplenmentary Code. in quality to that specified by the purchaser of any product. strued to apply to employment contracts. the date of such invoice. ctu-tcm riily used in the Industry. is not available for inspttion. that any such threat is unwarrnintcd and unjustified. by the Supplementary Code Authority. licen.-e, rule or regulation issued under said Act. ported by a majority number of the total votes cast. oppress or discriminate gaiinst small enterprises. possible, be limited to actual additional increai.s-e in the seller's costs. on the tenth calendar day after its approval by the President. Approved Code No. 84-Supplement No. 34. Wire Rope & Strand Manfufacturers Association. in order to meet the requirements of the National Recovery Administration. Code Authority, shall be as set forth at the foot of this letter. 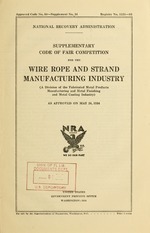 Wire Rope & Strand Manufacturers Association.